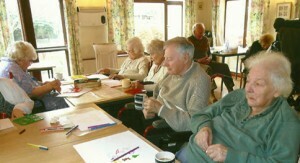 Ware has a large population who live in the town’s many Care Homes. Recognising and valuing this portion of our community, volunteer teams regularly visit residents in a number of them. We work in conjunction with the care home management and activity/engagement coordinator to organise, run and enjoy fun activities together such as tea parties, “move it or lose it” exercise, music, crafts and games, as well as conversation! The aims of the visiting group are to bring the community into the care homes and share God’s Love with those resident in them and to let the care home residents know that they are not forgotten, by providing friendship, stimulation and laughter. Note: this activity complements, and does not replace, the pastoral or spiritual visiting programmes which are provided by the priests and other authorised persons from the Churches in Ware.